During summer I rarely wear socks, but once the weather gets colder I LOVE socks! If you see me during the colder months of the year, I'll be rocking socks with patterns: argyle, stripes...I even have a pair of Wonder Woman and Bears knee-hi socks. But the one thing that I have searched for is the perfect rain boot sock. I have some great cozy socks for super cold days, but they only go up past my ankle. They are good for hanging out at home and my snow boots. But I love wearing my mid thigh high rain boots on rainy days and especially slushy winter days. And the flaw are socks. My knee-high socks aren't thick enough to keep me warm and my warm socks are too short and end up crunched up at my toes. WORST! I wore them twice last week. The first time on rainy cool Halloween. They went great with my pirate wench costume. And then on Sunday when all I was looking for was warmth as I watched my daughter play her last soccer game of the fall season at a field just off Foster Beach. COLD! But my feet weren't. These socks are thick. Soft on the inside. Keep my feet warm. And don't fall down when I wear them. Seriously no downside to these babies. Well, maybe one...but it's not the socks' fault really. I have calves that aren't sticks, even in my thinner days, my calves are muscular. So the room in my boots for anything extra is slim. But these socks make the cut. Don't believe my review? Try them yourself! Yup, I'm giving away a pair of Heat Holders! They come in men's, women's and children's sizes. Although, other than the colors, i don't see any difference in men's and women's socks. You can pick any size or style. 1) Comment to enter. You must leave your email so I can contact you. 2) Tweet out this entry for an extra entry. Make sure to include @veronicaeye in your tweet so I know you did this! 3) Share on FB, Google+ or any other social media outlet for additional entries. Tag me if you can. If not, please leave a comment here with a link. 4) MAXIMUM entries is 4 per person. 6) Sorry, US addresses only. PO Boxes are fine. Disclaimer: I was sent this review pair of socks by a publicist. That's the only compensation I have or will receive. With lots of dog walking in my future this winter, these sound great! Oh how fun... I love the idea behind this. Perfect for those cold weather football games! 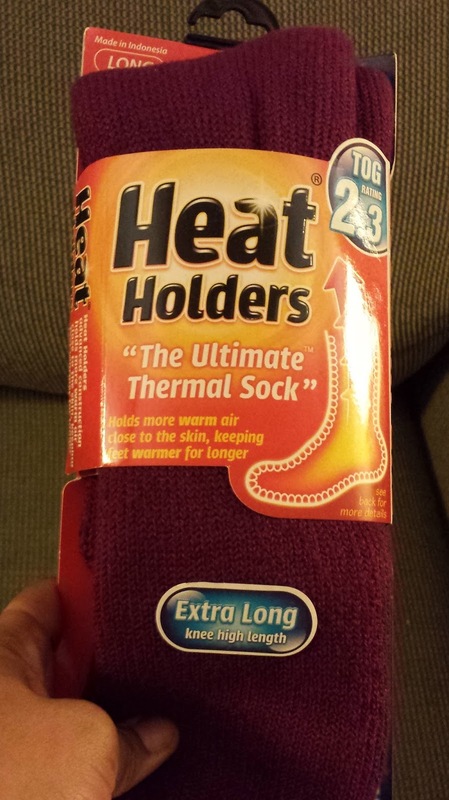 My feet are always cold so this product seems like a great thing! I would love to have these socks! I work outside everyday and my feet get so cold in my work boots!